August is Facial month at James Barclay Spa Salon. Facial Pedicure Package that is being featured in August is called “Discover Relief.” It has a regular Pedicure, plus a basic Facial called “Facial for Radiant Skin.” If your just ending holidays and going back to work, what a great way to treat yourself. All this summer heat has caused your pores to open more and it’s let the natural oils from the skin get in and clog up your pores. A deep cleansing Facial should take care of it. Walking around in sandals all Summer? Callous building up on your feet? A Spa Package wold take care of these two needs quite nicely. I just received the Facial Waxing promotion that there offering this month. Look at my Manicure…I’m so happy. The single service offer until June 30th, (or while supplies last) is for every person that visits us at the Spa Salon and receives a Manicure, will also receive a trail size of Aveda Hand Relief. If it’s a skin moisturizing Paraffin manicure that you like, then your probably already aware that the heat generated from the Paraffin is really great for sore and aching hands. Possibly it’s a clean looking and elegant French Manicure. (My favorite.) Or maybe it’s our most luxuriant Manicure,” The Aromatherapy Manicure.” Aromatic oils combined with an application of heat and an extended hand massage makes this a fabulous experience. Be sure and watch this site for coming news about Aveda’s new launch of Tulasara Skin Care Products. This launch will bring it’s own new Manicures. This offer is good with the purchase of a single service Manicure only. A special offer that runs all year long is our 25% off single services. It’s quite simple really. You pay for three single services, then receive four of the same services. An ideal gift giving solution. Enter one per Gift Certificate or all on one. Give the four services away to whomever or however you want to give them. Possibly to co-workers for jobs well done. If you know some one who gets the same services all the time, then this offer is the perfect gift. Possibly it’s our basic Facial that you’re interested in. It’s called Facial for Radiant Skin. We also have a Facial for Self Renewal which has extractions (removal of debris from pores.) Another Facial we have is a Facial for Mature Skin. 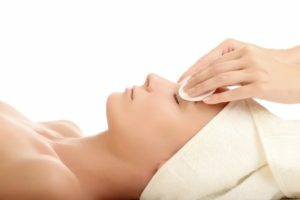 Choosing to get Waxing services? We offer a full menu of facial and body hair removal. In body Waxing, the area is powdered,waxed and then a cooling moisturizer is applied to minimize irritation. I think I’ll chose some new Spring colors for my Manicure and Pedicure. Gift Certificate offer is our Mother’s Day promotion for a Spa Package called ” Create Tranquility.” It consists of a Facial, Pedicure and a Manicure. There is a $15.00 saving for the three services if purchased as a Spa Package. Also, if purchased in Gift Certificate form, there is a further saving of $16.90 because there is no Sales Tax on Gift Certificates. The Spa Package can be spread over multiple visits. 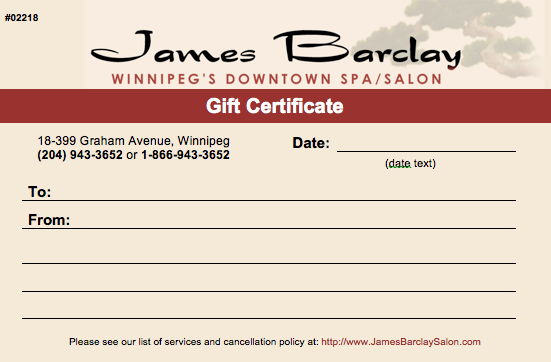 The Gift Certificate is also transferable and no expiry date. A Gift Certificate received for a specific Spa Package means the recipient will receive multiple Spa Services. Each service in the package comes at a greatly reduced price, which enhances the Gift even more. Giving a Gift Certificate or a Gift Card for only monetary value means the receivers may end up paying full price for the spa services. If their not aware of the big savings in purchasing their services as a Spa Package, maybe you need to make them aware of it by purchasing the Spa Package in the form of a Gift Certificate for them and letting them change it around. Spa services can be substituted or upgraded for other services. Choosing to get Waxing Services? We offer a full menu of Facial and body hair removal. In body Waxing, the area is powdered, waxed and then a cooling moisturizer is applied to minimize irritation. For Brazilian Waxing, the front,back and bottom are all waxed. Facial with extractions is our promotion for this time period. Any one who schedules an appointment for our introductory Facial, called Facial for Radiant Skin, will automatically be upgraded to allow for extractions. Normally, extractions are not included in the Facial for Radiant Skin. From now until May 14th, enjoy the benefits of a higher priced Facial,($85.00) and only pay the lower priced Facial fee ($75.00.) This offer of Facial with extractions does not apply to Facial for Mature Skin or Facial for Problematic Skin. Facial with extractions makes some people very nervous. They think it will hurt and cause the skin to redden and look inflamed.By the time they’ve changed out of their Spa robes and made their way to the cash out, most of the redness has gone away. It is amazing to see how much debris comes out of the pores. Most people don’t realize how much product residue gets into the pores.Some times their surprised when they can see how much is on the two tissues. 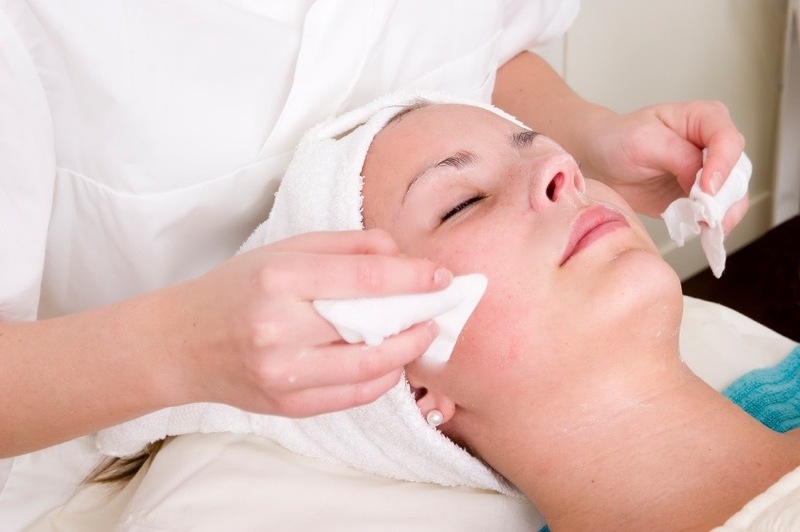 Trained Estheticians know how much pressure to apply and which areas generally need looking at. While some types of skin offer real challenges in this area, other types of skin need hardly any maintenance. Possibly a Pedicure? Wearing shoes all day, makes for very dry feet. Relaxing and enjoying a Spa Pedicure makes a whole lot of sense. Maybe a facial with an exfoliation masque is needed. Perhaps it’s time for some waxing services. You may also just need some down time. Why not come in and enjoy relaxing at the Spa while you receive one or two services from a Spa Package. But wait… a really good way to make yourself feel better, is to give someone a Gift Certificate for Spa Services from James Barclay Spa Salon and really make their day Great! Extractions being performed during a Facial. Waxing promotion is for a limited time only.Between now and April 23rd, we are offering one of three different parts of the face or body to be waxed at the discounted rate of $25.00 per session. Chose waxing hair removal for a Bikini, or the lip and brow or a half leg. Here’s an opportunity for first time to waxing people. Summer is coming and if you want to take the worry out of walking on the beach or lying on a blanket, now is the time to come and see us for a Bikini waxing. Possibly that small amount of hair on your upper lip is beginning to get to you or maybe you’ve always wondered what a good eye brow shaping would look like on you. Again, this waxing promotion is for a limited time only,give us a call soon! Extended Bikini and Brazilian waxing services are available for an up charge. I’m so glad I took advantage of the Waxing offer. Possibly a Pedicure? Wearing shoes all day, makes for very dry feet. Relaxing and enjoying a Spa Pedicure makes a whole lot of sense. Maybe a Facial with an Exfoliation Masque is needed. Perhaps it’s time for some Waxing services. You may also just need some down time. Why not come in and enjoy relaxing at the Spa while you receive one or two services from a Spa Package. But wait…a good way to make yourself feel better, is to give someone a Gift Certificate from James Barclay Spa Salon and really make their day Great! The bi-weekly promotion from April 1st till April 16th is for waxing services. Chose waxing hair removal for Bikini or…lip,brow or…half leg and the fee per session is only $25.00. Extended Bikini and Brazilian waxing services are available for an up charge. This offer is for a limited time only. Give us a call soon. A new direction in our promotion of James Barclay Spa Salon. Starting this past February, we have begun posting on Facebook on a daily basis. We’re trying to keep you informed on what’s new from Aveda, plus what promotions are being offered. From time to time, posting from the Down Town Biz will also be shared. 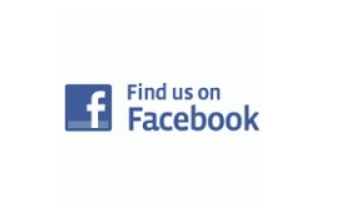 Just go to Facebook.com/ James Barclay Spa Salon. All first time guests that come to enjoy Spa services at James Barclay Spa Salon, will have their name entered in a draw. A $100.00 Gift Certificate will be awarded to the lucky recipient. Here’s an opportunity to receive even more relaxing and de-stressing Spa services. After winning the Gift Certificate, it is possible to pass it on to someone else. Give it to a special someone as a gift for any occasion. The draw will be made on March 31/16. Any Spa service will qualify you for this Gift Certificate offer. Given the time of year, maybe you just want a Manicure. Hands and nails are really dry and brittle. A professional Manicure using only Aveda Skin and Body Care products is recommended. Possibly a Pedicure? Wearing shoes and stockings all day, combined with having the heat on in our buildings, makes for very dry feet. Relaxing and enjoying a Spa pedicure makes a lot of sense. After the nails are trimmed and filed, the callous from the bottom of the feet is removed. After the nail and callous work is completed, then Aveda balancing oils and Foot Relief is applied. The oils and Foot Relief are then gently massaged all over the feet. Pure bliss! Perhaps a Facial is needed. Facial skin can become quite flaky during winter months. Exfoliation masques are used to clean away the dry skin and make the face glow. Choose a Facial that comes with extractions. This means cleaning the debris out of the pores because they become clogged with facial oils and even some of the creams we put on our face. Once received, a Gift Certificate builds a mental Spa experience for the recipient. Exciting News! 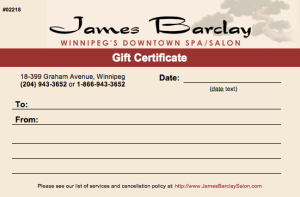 All first time guests that come to enjoy Spa services at James Barclay Spa Salon, will have their name entered in a draw. A $100.00 Gift Certificate will be awarded to the lucky recipient. Here’s an opportunity to receive even more relaxing and de-stressing Spa services. After winning the Gift Certificate, it is possible to pass it on to someone else. Give it to a special someone as a gift for any occasion. The draw will be made on March 31/16. Thinking of heading to a sunny place soon? Getting a Bikini or Brazilian Waxing service before you leave makes good sense. Taking away the worry before you go walking or strolling along the beach makes for a more enjoyable vacation. We also offer complete waxing services for facial and body hair removal. Our Bikini or Brazilian waxing services are fairly priced because we’ve taken the average price of the same waxing services at Spas around us. All possible steps are taken to reduce skin irritation. For Men’s under arm, back or chest,the same procedure for Bikini or Brazilian waxing is used. The area to be worked on is first powdered to help protect the skin from the wax. The wax is applied to small areas as this reduces the discomfort greatly. Finally a cool moisturizer is applied to help minimize the irritation. The fee for men’s waxing services depends a lot on the amount of hair to be removed. This effects the amount of time needed to properly remove all of the hair. The price may vary from person to person.